When Life Knocks You Down . . . Get Back Up! My intention for this blog is to share what I've learned, and am still learning, about resilience and living a courageous and authentic life. For this first post, I offer gratitude to my parents who beautifully modeled resilience for me and my siblings (five brothers and one sister). I was the recipient of resilience training from an early age. 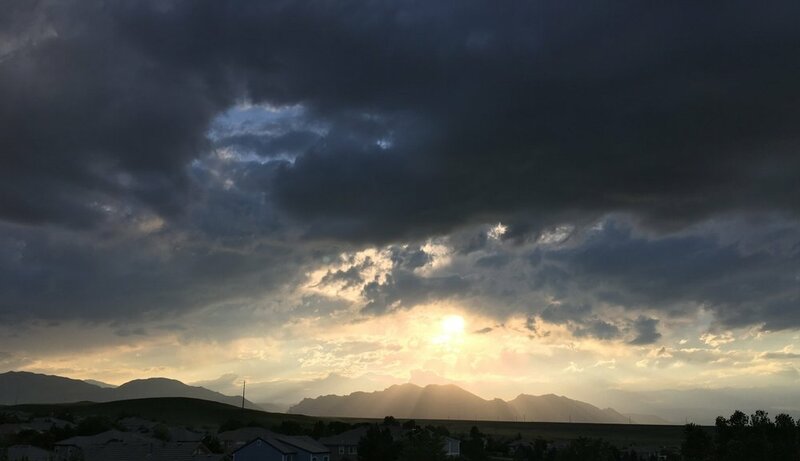 I grew up on a farm where dark, ominous clouds coming over the mountains could mean rain, or they could mean a terrible hail storm that would damage crops and affect the yield. During one memorable hail storm, I looked at my mother, visibly worried—already calculating what a significant crop loss would mean to the family finances. Then I went and stood by my dad, who was looking out the window at the storm as large hail stones bounced off the grass with such force it was easy to imagine the damage the hail was doing to the garden plants and cash crops which had been carefully planted, watered, and weeded. My dad was silent, and so was I. After a time I heard him say: "Isn't it beautiful?" I checked to make sure we were looking at the same thing—possibly the near destruction of a season's worth of work. We were. But Dad was able to see beauty even in a moment of great loss. When the storm was over, there were some heavy sighs. My dad and brothers went off to assess the damage, while my mom began preparing supper. I asked some questions about what would happen . . . if the damage was really bad, would we have enough money until next year? Would we have enough money to buy school clothes in a few weeks? The news wasn't very good. But work on a farm doesn't end after a hail storm, or when the wind blows so fiercely it shatters most of the beans out of their pods just days before they are dry enough to be harvested. The chickens, cows, and pigs still need to be fed, and so do the people. So we harvested what we could of the cash crops, gathered in the garden produce that survived the storm, and kept to our daily work schedule. We survived that storm, and many others like it. There was a stoicism, and a courage that we didn't verbally process. Every day we got out of bed and did the best we could with whatever we had to work with. When I was eighteen I waved goodbye to the farm. I was off to get a college education and hoped I would never again have to suffer the capricious storms mother nature doled out. I was too young and naive to understand there are other devastations we sometimes have no control over. As my life has unfolded, I've leaned on the important lesson of resilience my parents taught me: when life knocks you down, the next step is to get up. Thank you, Mom and Dad.